What is JDA Demand Planning? JDA Demand Planning is a system that improves the accuracy of your business and inventory plans by building an incorporated, synchronized picture of true demand signals across your trading network. This planning management solution helps you avoid having too much or too little items in your inventory. Too many stocks can result in a huge surplus that ties up your capital. If you have too little, then you risk running out of stocks and unable to address demand quick enough. With JDA Demand Planning, you can create effective and viable plans based on real-time collaborative scenarios. The software also helps you make accurate projections even on slow-moving and hard-to-dispose products as well as new items in your inventory. JDA Demand Planning also facilitates inputs from partners and internal stakeholders via mobile capabilities and its web interface. 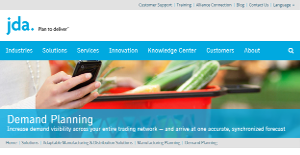 JDA Demand Planning is a planning management solution that helps businesses analyze demand signals across their network so they are able to make accurate demand forecasts for their products. As part of the JDA integrated retail and supply chain management suite, JDA Planning ensures that businesses fill or replenish their stock based on actual demand, instead of relying on guesswork. The software significantly optimizes your company’s inventory, resulting in improved inventory turns and availability. JDA Demand planning improves forecast accuracy, which allows companies to devise and expertly implement strategic pricing and promotions for better revenue. The improved accuracy of demand forecasts also impacts the expenses of overall supply chains. By precisely matching demand and supply based on accurate analysis of demand signals, expenses that stem from placing orders, acquisition and delivery of items, and its eventual disposal are greatly reduced. Businesses don’t have to suffer losses that comes from disposing large volumes of supply if they purchased way more than their demand. They also don’t have to repeat costly transactions if they ordered way less. JDA Planning virtually gives you the accuracy you need to ensure that your inventory is filled and replenished. No guesswork. Just effective and accurate analysis of true demand signals to help propel your business to success. Since each company has unique business needs, it is sensible for them to abstain from looking for a one-size-fits-all faultless software solution. Needless to say, it would be useless to try to find such an app even among widely used software solutions. The smart thing to do would be to list the various vital elements that require consideration such as main features, budget, skill levels of staff members, company size etc. Then, you should do your homework thoroughly. Read some JDA Demand Planning reviews and check out each of the other apps in your shortlist in detail. Such exhaustive groundwork can make sure you discard ill-fitting systems and select the system that presents all the elements you require for business success. How Much Does JDA Demand Planning Cost? We realize that when you make a decision to buy Inventory Management Software it’s important not only to see how experts evaluate it in their reviews, but also to find out if the real people and companies that buy it are actually satisfied with the product. That’s why we’ve created our behavior-based Customer Satisfaction Algorithm™ that gathers customer reviews, comments and JDA Demand Planning reviews across a wide range of social media sites. The data is then presented in an easy to digest form showing how many people had positive and negative experience with JDA Demand Planning. With that information at hand you should be equipped to make an informed buying decision that you won’t regret. What are JDA Demand Planning pricing details? What integrations are available for JDA Demand Planning? If you need more information about JDA Demand Planning or you simply have a question let us know what you need and we’ll forward your request directly to the vendor.